Low Cost programmable DC Power supplies from 60W to 12KW. Many models to choose from with optional GPIB and RS232 interface. Ideal for benchtop or ATE applications. 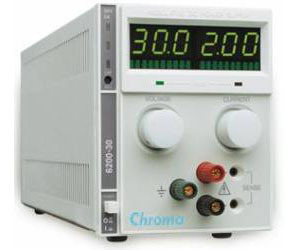 The Chroma 6200 series low power (60W) programmable DC power source, deliver low output noise and ripple (Voltage < 1mVrms, Current < 1mArms), excellent line and load regulation, and fast transient response. With wide range of voltage (7V-250V), Current (0.25A-6A) combinations, it is used in every part of your manufacturing process from design to production test. Programming interface(APG)-master/slave tracking, Internal RS-232 interface-serial instrument programming using the RS-232 protocol, GPIB Interface with 14 bits resolution and software calibration. The instrument offers quality and reliability for even most demanding applications in production testing, R&D design characterization, and QA verification.